While Chinese Premier Li Keqiang was on a three-day visit to Germany, he made a significant statement about the political situation in Hong Kong. Somehow his opinions were not considered worth reporting by the state-run media in China. When asked during an Oct. 10 press conference in Berlin about Hong Kong’s Umbrella Revolution, Li said the Chinese authorities have not changed their stance regarding the “one country two systems” policy. In addition, Li said that he believed the people of Hong Kong have wisdom, and the Hong Kong government has the ability to maintain prosperity and ensure safety in Hong Kong. In mainland China, Xinhua News, People’s Daily, and CCTV, the main mouthpieces of the Chinese Communist Party (CCP), did not deem necessary reporting on Premier Li’s interpretation of the one country/two systems’ policy that governs China’s relations to the Special Administrative Region of Hong Kong. The English-language website of CCTV, which is targeted at an audience outside China, did report the premier’s remarks..
Li’s remarks concern the topic that is at the heart of the controversy now raging in Hong Kong. On June 10 the State Information Office issued a White Paper that in effect interpreted the policy of one country/two systems out of existence. That policy had guaranteed Hong Kong for the 50 years following its hand over in 1997 from the United Kingdom to China a high degree of autonomy, the enjoyment of a capitalist economic system, an independent judiciary, and protections for individual liberties. The White Paper declared that Beijing could alter the arrangements inside Hong Kong in whatever way it thought fitting. The paper also determined that Beijing could rewrite Hong Kong’s Basic Law—its constitution—at will. The White Paper alarmed Hongkongers—an estimated 500,000 turned out for the July 1 pro-democracy march—and undermined the legal basis for pushing for universal suffrage in Hong Kong. The Chinese Communist Party’s mouthpieces have praised the White Paper. “The white paper itself is a summary and interpretation of lessons learned before and experience gained now. It serves as a guidance and reference for the future,” People’s Daily said. On Aug. 8, CCTV reported that Lau Siu-kai, deputy president of the Chinese Association of Hong Kong and Macao Studies, gave a talk in Hong Kong on the content of the white paper and how it paved the way for unique democracy in Hong Kong, on Aug. 8. On June 17, one week after the White Paper was issued, during a visit of Li Keqiang to the United Kingdom, China and Britain issued a Joint Declaration that said following the one-country, two-systems principle, maintaining Hong Kong’s Basic Law, and promoting the prosperity and stability of Hong Kong are in line with both parties’ mutual interest. 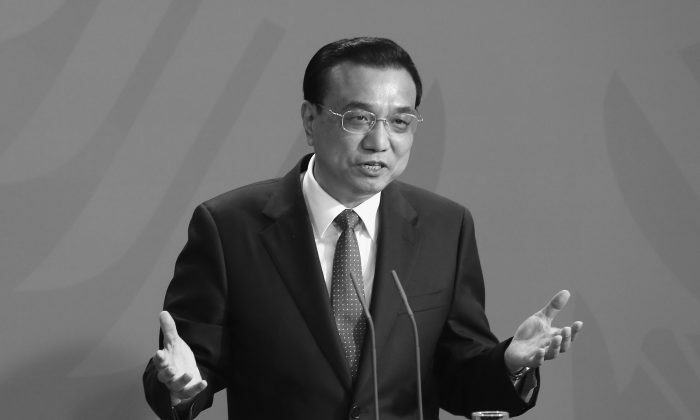 As with Li’s remarks in Germany, Premier Li did not comment directly on the White Paper, but his remarks were widely understood to be a criticism of it. CCP leader Xi Jinping, also stated that the Chinese authorities will firmly adhere to the policy of “one country, two systems” in a meeting with a delegation of Hong Kong business tycoons at the end of September this year. In China, both CCTV and People’s Daily have recently been targets of the anti-corruption campaign headed by Xi Jinping. That campaign has often been used as means for removing Xi’s opponents under the guise of cleaning up corruption. Hackers with Anonymous leaked tens of thousands of Chinese government files in the #OpHongKong hacker operation to support democracy protests in Hong Kong.